So I’ve seen this tip on Pinterest several times and today the planets aligned and I was able to make one for myself. And by planets aligning, I simply mean that I happened to have the need for one right when I had a nearly empty salt container. 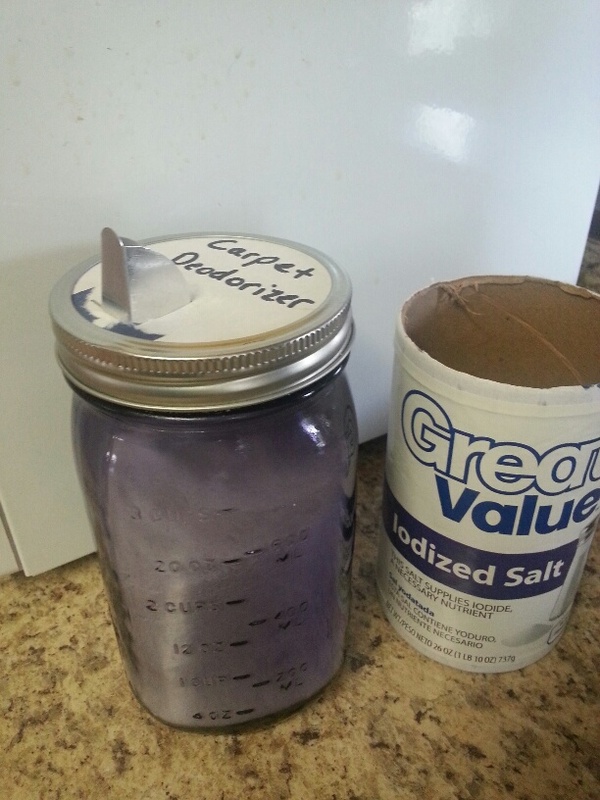 I finally got around to vacuuming today and wanted to use my homemade carpet deodorizer (recipe below). But I tend to accidentally shake half the powder on the carpet when I try to shake it out without some sort of top on the jar. I thought about punching holes in a jar lid, but then I remembered this tip. All I did was use a sharp knife to cut the top off the salt container, then put it on the jar in place in the lid. It worked remarkably well! It is the perfect size for a wide mouth jar. 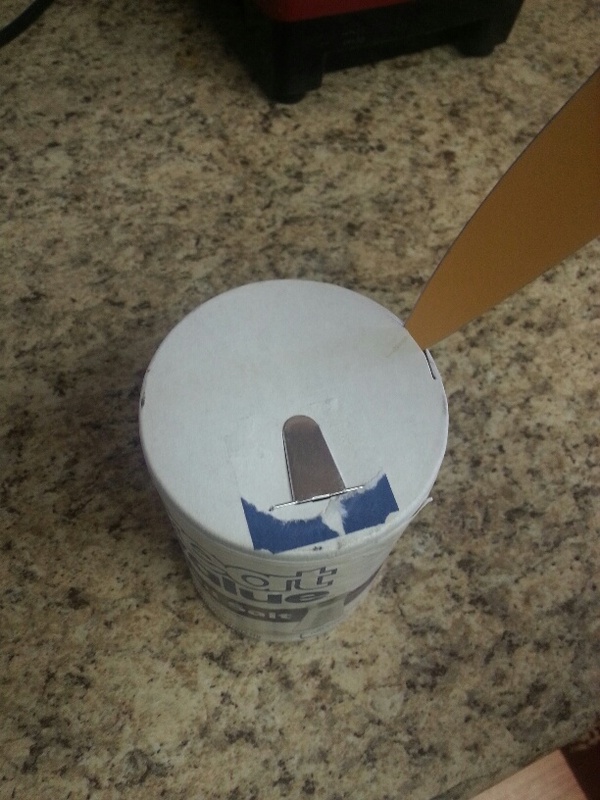 In order to use a regular mouth jar, just trace around a regular size lid and cut it down accordingly. So, the carpet deodorizer recipe. That also is super easy. -Add 10-20 drops of your favorite essential oils (we like orange and clove or lavender and eucalyptus), put the lid on, and shake the jar to distribute the oils. -Shake the deodorizer on your carpet 15-30 minutes prior to vacuuming (test on obscure area 1st). -Do not use baking soda, it is too powdery and tends to leave a white residue, thus why the recipe calls for washing soda. It still absorbs the odors of stinky carpets but is more granular. It can be found in the laundry isle of most grocery stores. -You can fill your mason jar full, but then you’d want to dump the soda into a bowl, add the oils, mix, and return to the jar. Otherwise the jar will be too full to shake to distribute the oils. I prefer to just do it as stated above so I don’t have another dish to wash.
-I find that I use about 1/4 of the jar (roughly 1 cup of the mixture) per application. Depending on the size of your house you may have to use more or less. This is where the salt container spout comes in handy as I found that without it, too much sprinkles out and I invariably ended up using over half my mix for one round! I really like that this carpet deodorizer is all natural. No weird chemicals to worry about around my family. So aside from vacuuming my house (finally! ), and in between the daily tasks of taking care of the family, I started researching how to make candles from scratch. An article I read recently got my gears turning and Hubs and I got to talking about all those skills which we have a theoretical knowledge of, but have never actually tried. Like candle making. Did you know that you are supposed to treat wicks with something like boric acid in order to make them burn properly? I had no idea, and my minimalist side is wondering if it really makes a difference. So my plan is to try a couple different types of wicks and see what the results are. 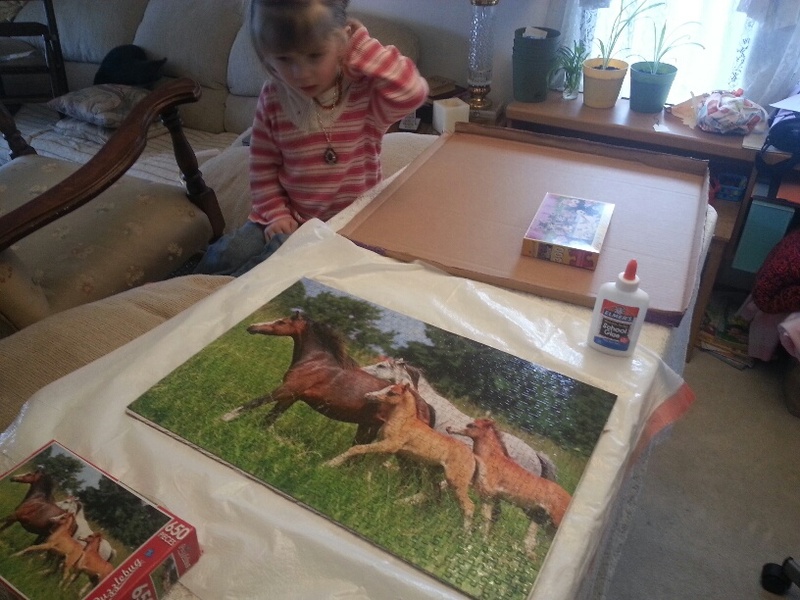 Princess Girl and I also got around to mounting the puzzle we finished a couple weeks ago. I cut a piece of cardboard the same size as the puzzle, we covered it in Elmers glue, then slid the puzzle onto it and slathered a bit more glue on the top. Then, when it had dried a bit, we covered it in plastic and put a box on top to keep it from bowing. Princess Girl is going to hang it in her room when it is finished. And that’s how this homesteader spent her day. This entry was posted in "Daily Life" journaling, Homemaking, No Way!, Portland Interlude 2014-2016, Recipes and tagged DIY, Homemaking, Homestead Kids, Natural, no way!, recipe, Recycle, Reduce, Reuse on January 29, 2016 by Maridy. Sounds like you had a good day! Will you frame the picture, or hang it like a poster?